In an attempt to remedy my waning inspiration, I did a little shopping! I didn't walk away with much because I was short on time, but among the loot was this amazing top. It's practically perfect in every way with its sheer animal-print fabric, loose fit and bow tie. I see myself wearing it so many ways, and so will you! CUTE!! and you are rockin the red lipstick.. great outfit.. like the pop of yellow for the belt too!! Aww, I'm totally loving that pants.. Look great on you! LOVE that yellow belt! So unexpected and works perfectly. Totally agree that top is awesome! I'm addicted to any sheer top that ties at the neck. What a great look! I love your leopard top! I've been following your blog for a while and love it! You have such great style! What brand is the leopard print blouse at Target? I MUST have one, lol. I attempted to find it online with no luck. I live in Brooklyn and try to avoid actually going to the Target stores here because they're always picked clean and unorganized. Makes for a not so great shopping experience. Boo. I almost bought that top a couple of weeks ago, but I had zero money at the time. I was just thinking about it today and now seeing it on you, I'm pretty sure that I'm going to have to go back and get it! Oh so seventies, oh so right. ur top's from target?!?! amazing!! Please let me shop in your closet!! 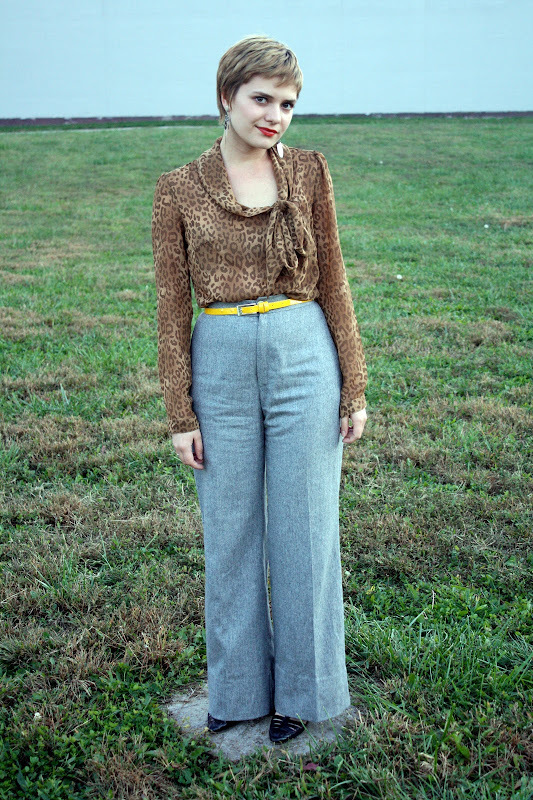 I am a leopard print FREAK and the way you paired it with wide legged pants & and thin yellow belt really set it off. I can't believe it's from Target! Annnnddd... now I need to go to Target! Great top! Looks great with the gray. oh my goodness. I had mentally sworn off the animal prints, but I love the cut of the blouse. May have to rethink my rule. cool shirt! love leopard print so much! Cute!! and you are rockin the red lipstick.. great outfit..